Carole's Chatter: Reminding you of another Top 20 Book - Can't we talk about something more pleasant? Reminding you of another Top 20 Book - Can't we talk about something more pleasant? Until recently I wasn't even conscious of this genre of books at all. It is graphic in the sense that the author handwrites the words and includes hand drawn pictures – but I mostly certainly wouldn't class it as a comic book. 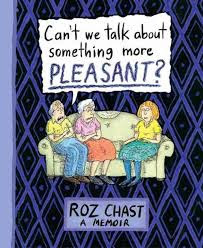 Roz Chast is fantastically talented. This book is a memoir of the last years of her parents lives - but it most certainly isn't all gloom and doom. To me it was an honest appraisal of the challenges of dealing with elderly parents with a wry understanding of the foibles both of the parents and of herself as a daughter. I enjoyed this book immensely. One of the best of the year, if not decade! I hope the pics give you a taste for the book. I've given graphic novels a pass up until now, but this is one I might actually pick up.